Cost: Varies, depending on materials selected. Approximately $20-35 as shown. 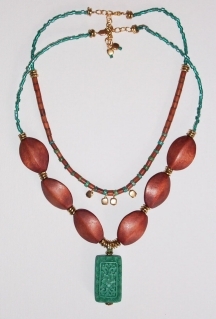 Wood and turquoise with gold are hot color combinations, and this necklace set is funky and fun...and easy to make. Notes: Decide how long you want your handcrafted necklace to be. I went for a standard 16 inch length with an extender chain. 1 focal drop bead in aqua or turquoise color. 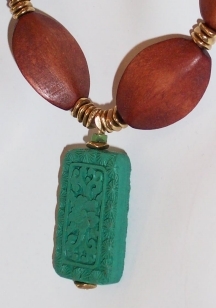 I used a carved lacquer turquoise colored bead in my design. I found some carved lacquer beads, here. Seed beads of choice in a turquoise color. 1 clasp of choice. I used a 14KT GF lobster claw clasp. One 2 inch length of extender chain. I used bulk, gold-tone base metal cable chain. Medium sized gold spacer beads. I used round gold-tone spacers in a disc shape. Thread a gold spacer bead, your focal pendant bead, and another gold spacer bead onto a long headpin. Make a closed wire loop at the top. If you need help wire wrapping a loop, just follow these instructions. Slide a seed bead and a gold spacer onto the other headpin, and make a closed wire loop attaching it to one end of your extender chain. Tie a knot on one end of the wire, or place some tape over the end, and string all of your beads onto the wire. Check the length and overall design and make adjustments by adding, removing, or re-positioning beads until you are happy with the look of the bracelet. You can do this first on a bead design board if you prefer or use a ruler. 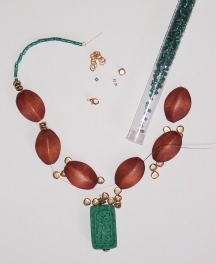 To follow my design pattern, start with a few inches of seed beads, a few gold spacer beads, wood beads, gold spacers, and then the center focal bead--and then repeat the pattern in reverse up the other side of the necklace. 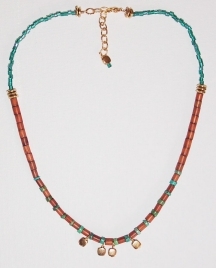 I used 8 gold spacers in the center of the necklace, and attached the turquoise focal bead in the center between 4 beads. Untie your knot or remove the tape. Slide a crimp bead onto the end of wire, and thread the wire through the loop on the clasp, and back through your crimp bead. Crimp the bead flat or use a crimping tool to close the crimp. Follow the How to Use Crimp Beads instructions if you are not familiar with this technique. Do the same thing on the other end to attach the extender chain. TIP - For an even more finished look, cover your crimp beads with the new crimp bead covers! That's it. Your great new pendant is ready to wear! 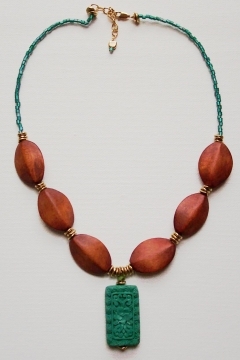 This necklace looks great with turquoise and wood jewelry. Try these additional designs.